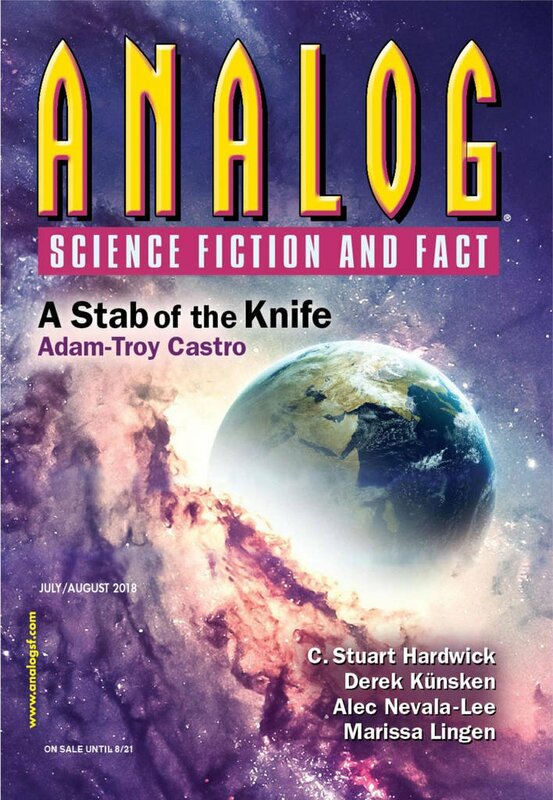 "Open Source Space," by C. Stuart Hardwick [bio] (edited by Trevor Quachri), appeared in Analog Science Fiction and Fact issue 07-08|18, published on June 15, 2018 by Penny Publications. Pro: It’s a cool little adventure story, and most of the fun is watching Kylie cope with one technical challenge after another before she successfully lands Snoopy on the lunar surface. Con: The whole thing is hard to believe. The lunar base having missiles at all. Anyone caring enough about blowing up Snoopy to make it a casus belli. Open source ever being able to put people in space. Even Yang’s speech at the end. Background: The Apollo 10 lunar ascent module, aka “Snoopy,” really was sent into orbit around the sun, and, despite some efforts, has never been found again.